With the onset of illegal activities at the watershed area, the Butuan City Water District (BCWD) has been exerting efforts on advocacy campaign to help save the Taguibo River Watershed. The City has been experiencing intermittent water interruption due to the temporary shutting down of the operation of the Infiltration Gallery during rainy days as the water at the river is very turbid. The high turbidity level at the water source can be attributed to activities in the area which are harmful to the environment including daily domestic activities. Because of the increasing number of dwellers in the watershed, any contributing activity plus those illegal activities conducted in the area caused the water in the river to be very turbid even with little rain. Recognizing the importance of the stakeholders especially at the grassroots level in the watershed area, the BCWD has placed importance in educating those living in the watershed because any activity they conduct in the area can have a great effect in the watershed. One of the proposed activities was the conduct of Watershed Community Symposium at the Sitios located in the Taguibo River Watershed Forest Reserve (TRWFR) to gather supporters in the campaign of saving the Taguibo Watershed and to disseminate information about the status of the watershed as well as encourage the dwellers to participate in the National Greening Program of the Department of Environment and Natural Resources. The Watershed Community Symposium is a quarterly activity conducted by BCWD to ensure sustainability of the information drive specifically designed for the residents in the Taguibo River Watershed Forest Reserve. This will ensure that the people living in the watershed area will be reminded of the important role they play in the protection and conservation of the watershed. This will also ensure that the residents will be reminded to take extra care in the conduct of their day to day activities as this will have a great impact in the water quality and quantity of the Taguibo River. Learn different environmental friendly activities so that they will not harm the watershed. 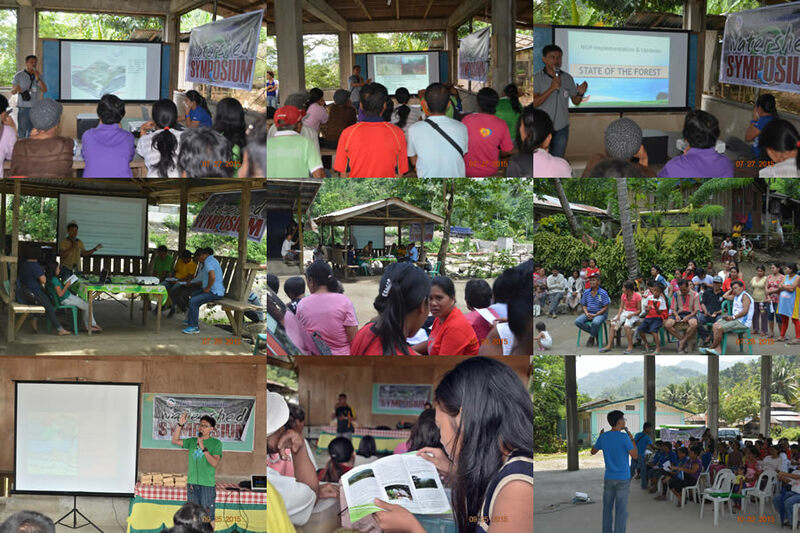 Last July 27-28, 2015, BCWD conducted the Watershed Community Symposium visiting two areas, the AWFPC Members at Sitio Mahayahay and Sitio Bungadman, respectively. Last September 25 and October 2, 2015, BCWD conducted the Watershed Community Symposium visiting two sitios, Sitio Tagkiling and Sitio Iyao, respectively. Last November 19-20, 2015, BCWD conducted the last set of the Watershed Community Symposium scheduled for 2015. The two sitios visited by BCWD were Sitio Mahayahay and Sitio Dugyaman. - Office of Congressman Lawrence Fortun represented by Ian Sabado. Would there be a chance in the future wherein they will be asked to leave the watershed because people are no longer allowed to dwell in the watershed? BCWD acknowledges and respects the CADT of the indigenous people in the area that is why BCWD, as well as DENR, has been helping the residents in the area to take care of the natural resources in their ancestral domain. BCWD also encourages the residents to participate in the rehabilitation and conservation of the area so that there will be a continuous support from other sectors. Anticala Barangay Captain Boligol inquired if BCWD can help in the cleaning of the septic tanks of the comfort rooms which were donated by BCWD to the residents of Sitio Bungadman. He also commented that it should be BCWD’s responsibility to fix the comfort rooms and not the barangay. The BCWD staff suggested that the Barangay write a formal letter addressed to the BCWD management regarding the matter.